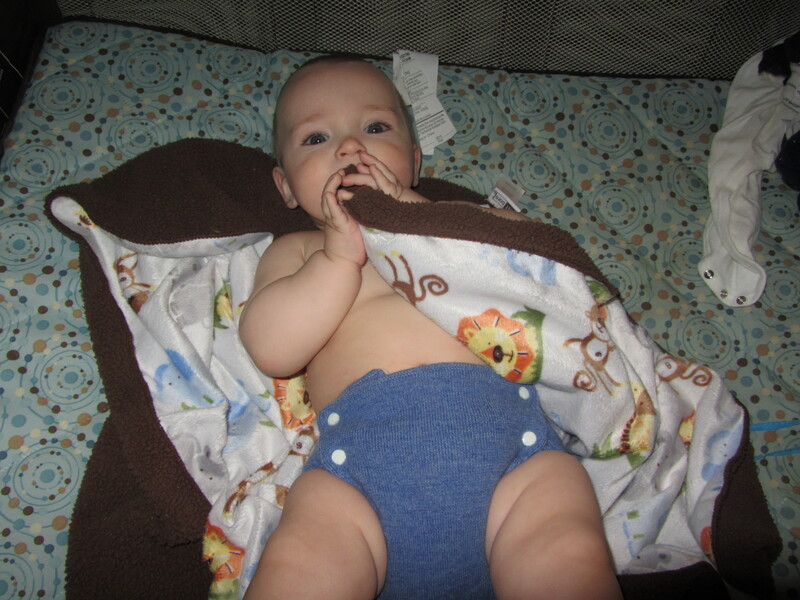 My Babee Greens review- Late last year I was able to pick up a Babee Greens wool diaper cover. I haven’t taken pictures of it yet, but it’s a nice light blue color with snaps on it, in most regards, it looks like a pocket diaper. I bought a size medium and had planned on using it with Kissaluvs size 1 fitted cotton diapers. We’ve now used both the Kissaluvs and Babee Greens quite a few times and I feel like I can give my opinion about it. I bought the size M cover, and it is a little big on my 20 pound baby. I love snaps, but the way this cover works is the front snaps onto the sides, it seems like it doesn’t close well, perhaps a lack of elasticity, and it’s a bit big on him. I feel that the way the snaps are, it makes it difficult to fully cover everything, because it just doesn’t seem as secure. It is nice and thick, but still breathable. The wool works beautifully, even though I worry about the closures. Every night it has kept things contained, no problem there. It dries great. Everyday we hang it on a hook to dry out, it doesn’t really get wet, but there is some wetness on the layer closest to baby. I haven’t had to wash it yet, so I don’t know how it will work with that. We haven’t used it more than 10 times, so we will be lanolizing soon. There are 3 sizes on the side flaps that the front snaps to, so this will grow with your baby for quite some time. The wool is so soft, I believe it is called Merino wool. It is put together very nicely, great quality. I have to say I like the wool cover. I’ve used it with the fitteds and with prefolds and it keeps him dry. He is not a heavy wetter, but over night of 8 hours, and no changing, there are no leaks. What do you think of Babee Greens? Share your comments below, I can’t wait to see what they come out with next. Oh, and please share this post on Twitter or Facebook, I’d really appreciate it.